From Niitvälja Golf, Estonia. Picture doesn’t do justice to the situation. Better choice would have been wet suit during that round. As the headline says it is the time of the year when I feel like a Michelin Man again! And it isn’t because the holiday weight I still might be carrying a little after the cold summer, it’s that autumn has started and we all have to face it here in Finland that shorts are now in the closet waiting for next year. On the golf course you have to wear ridiculously much of clothes! 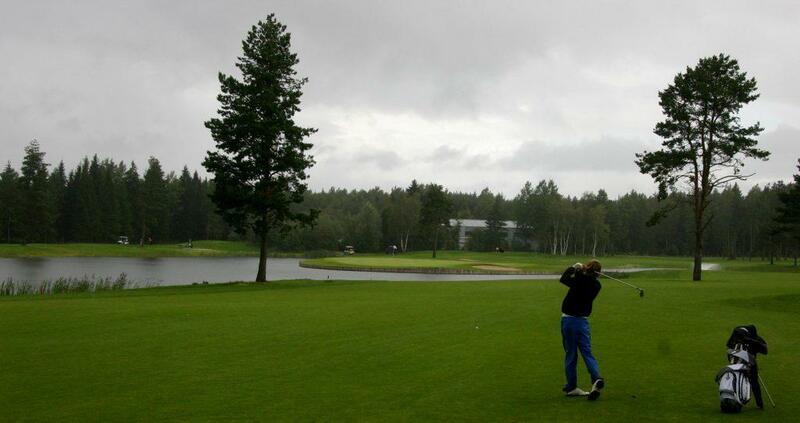 I’ve always been jealous for golfers who can retain their play with the same swing, no matter they’re wearing pikee-shirt or three pullovers and a thick raincoat. Luckily I finally found some light but warm clothes for the fall season last autumn. Helps a little but still I’d say my handicap is closer 11 than 1,1 this time a year. Funny how my mind deals depending where I’m playing. To sharpen: three years ago when played first time in Scotland I almost crossed my hands and prayed the night before that the conditions would be as mean as they can in Scotland at worst – or at its best. And yes, they definitely did! Wind was so strong I couldn’t hear a word my playing partner said during the 18 holes. It was +4 degrees but I can tell you I’ve never been so cold in my life. Not even the previous New Year’s Eve in Lapland and it was -30 that time! it was raining as well but impossible to use an umbrella, thanks to the wind. To be honest pleasure was far outside from the play but time will golden memories. Afterwards it was one of those rounds I’ll always remember. First time on links in very classic links style weather. And believe it or not but I played pretty good too. I couldn’t ask for anything more. These memories above have been running I my mind today again due the fact I’m playing twice this week. Cold already. And that’s why I’m heading to the pro shop trying to find at least some clothes I could wear and still play golf. I mean real golf, not like field hockey! A quick look to the weather forecast this morning reminded me to check my umbrella is in okay-shape. If the forecast is right, Speedos wouldn’t be bad option to wear on either. What I require from golf clothes in order of importance this time a year? First of all they have to stretchy. Rather a number too big than too small. It’s impossible to swing with tight jacket or under shirt. Secondly those have to be warm. Always more comfortable to play when you’re able feel your body. Thirdly water proof techology. Not until third because I know I’ll enjoy golf more when I play well, not when I’m dry but play poorly. Gore-Tex is a WP-technology everyone knows. I planned to be more enviromental this time and buy Sympatex clothes. See, no teflon has been used in Sympatex unlike in Gore-tex.